There’s a reason I love chicken fried rice and mu shu pork and beef with broccoli and bowls of thick egg drop soup. Several reasons, really, but one of the top ones is safety. Not food handling safety, though that's important EVERYWHERE. I mean the safety of knowing what you're getting when you order. These are dishes that may have a limited ceiling on how good they can be, but they also have a limited floor — they’re common enough that if a Chinese restaurant couldn’t make these at least passably well, that restaurant would almost certainly go out of business. And I have been punished on more than one occasion for ordering a lesser-known item on the menu. 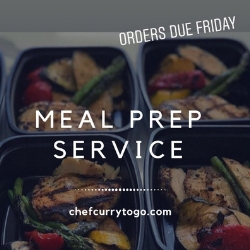 One thing you must understand about restaurants is that the most-ordered items are often the freshest items and the ones chefs are most experienced at making. Ordering seafood at a place not known for seafood, for instance, is a dicey proposition. And with many American Chinese restaurants, they pretty much know how to make the basics with a few variations. Go too deep into the menu and you may be getting that cook’s first ever attempt at that dish. Kwan’s Kitchen isn’t exactly American Chinese food, though there are a few dishes that definitely appeal to that palate. But while the dishes may have similar names or even flavors, the difference is in who is cooking the food and the ingredients they’re using. Chef Kwan is the owner and chief architect of the menu, which combines traditional Cantonese foods with French cooking techniques aimed at local diners. All of which is to say it’s fancy. It’s a nice restaurant with lovely decorations and a welcoming atmosphere, but it definitely feels high end. The food reflects that, too. Each time I’ve returned I’ve found more and more to recommend at Kwan’s. What do quality ingredients and an experienced chef in an attractive setting mean for you, the consumer? Higher prices. Good food costs more. A good chef earns more. Rent on a nice building is more. But it also means you’re getting a meal you’re more likely to enjoy and return to in your mind as the days go by, which is exactly what happened to me. My first expedition to Kwan’s was for dinner and it was good, but not spectacular. The problem, I later realized, was that I played it safe. But you don’t have to play it safe here. This is the kind of restaurant where you are rewarded for taking risks far more often than you’re punished. Which is not to say I didn’t get some old favorites anyway. 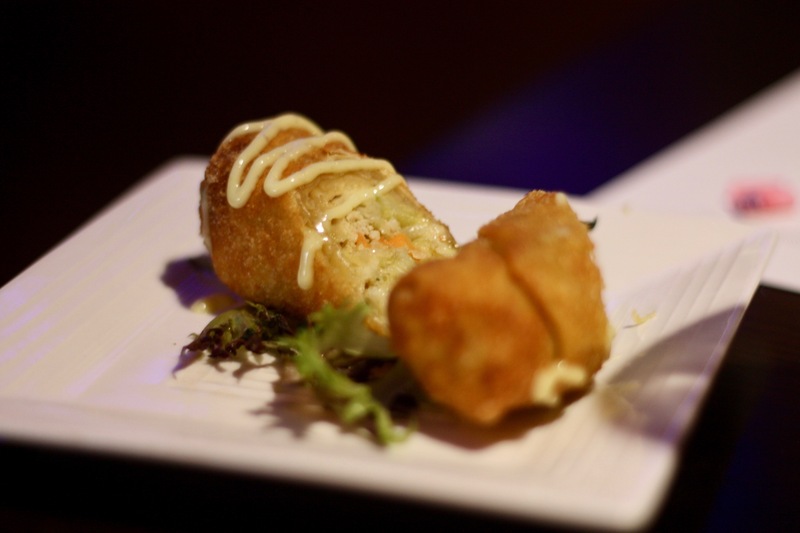 First off, get an egg roll ($3). I love egg rolls in general, but when I bit into this one I immediately knew I had a new favorite. Just look inside and you’ll see the difference immediately. There’s color in there. Orange carrot and green onion and not just pale cabbage and paler meat. The wrapper is fried to perfection, crispy and flaky and desperate to feel your teeth break through that tension. 10/10. That’s not a rating, that’s how many egg rolls I would eat if you gave me 10 of them. I’m the last person on Earth who should be fat shaming anyone, so please understand that I’m saying this with love: look at those chunky little pot stickers! Shanghai-style pan-fried pot stickers (four for $7) are gorgeous little dumplings that don’t adhere to what the fashion magazines say about how a dumpling should look. 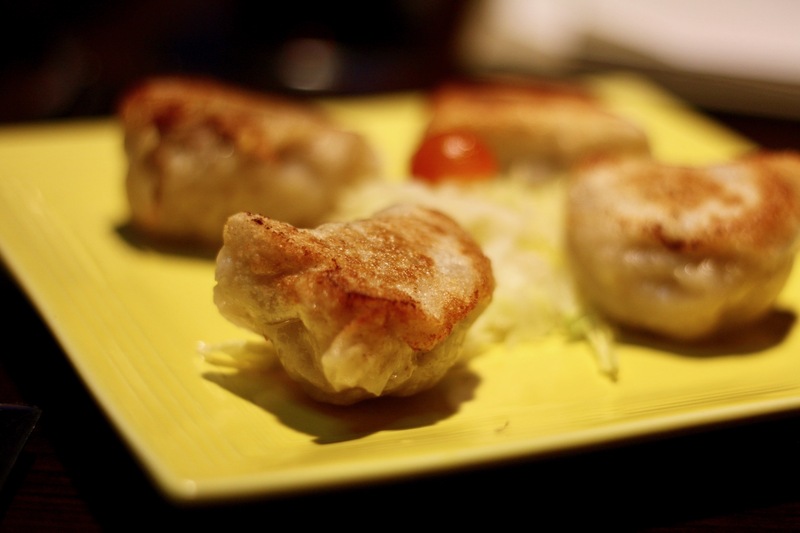 Yes, a thin, lithe dumpling is great, but so are these crispy, pork-filled beauties. The crispy seared sides gives you some good crunch, while the rest of the dough has that stretchy, chewy quality that makes them so addictive. 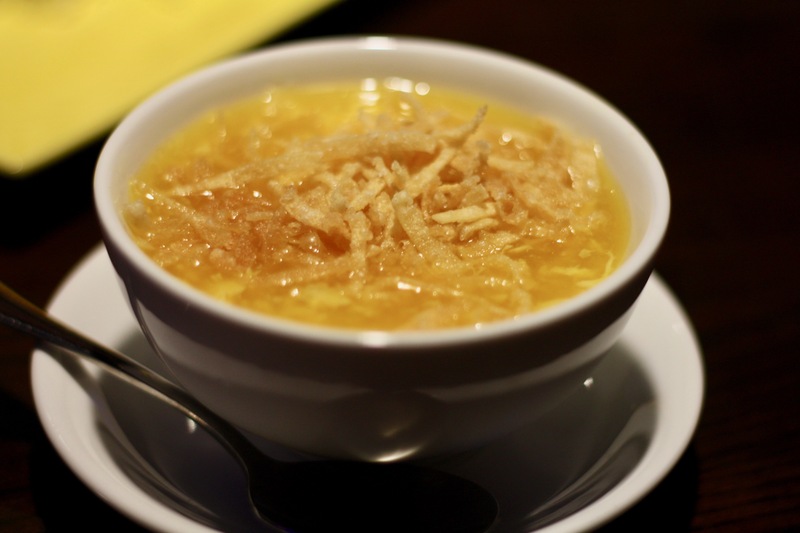 I have a legitimate weakness for egg drop soup ($4), but this might be the very best bowl of it I’ve ever had. The chicken broth was super rich, like Tony Stark rich, filled with gorgeous thin wispy ribbons of egg white. The care put into this soup that is so often an afterthought at other Chinese restaurants is one way I knew Kwan’s was the real deal. Food tastes better when chefs care. That’s it. And somebody back there loved this soup like it was their rich, egg-filled child. 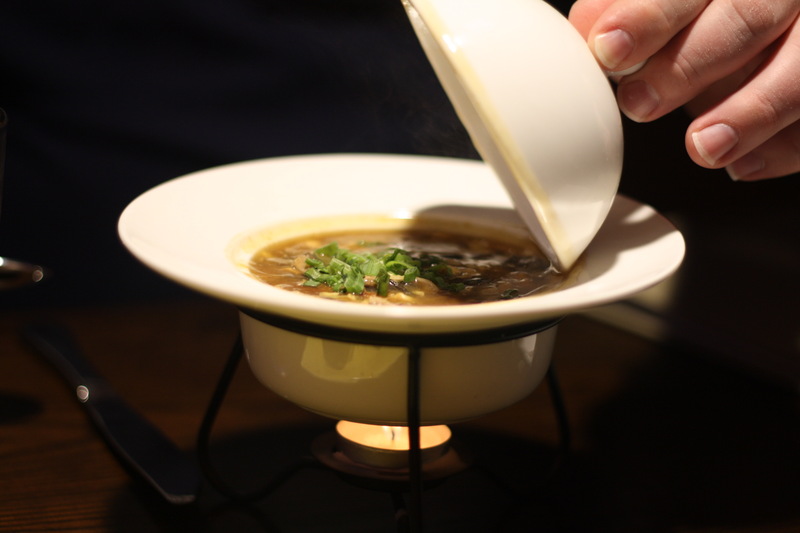 My friend Kevin got the spicy peppercorn shredded duck bisque ($6) and it won on presentation before we even tasted it. It comes out under a dome with a tiny candle underneath to keep it warm. That said, they could serve this soup in a styrofoam bowl and I’d still adore it. The bisque was heavy with mushrooms and had a lovely, creamy texture. But the duck, oh my, the duck. It wasn’t gamey, for one thing, but it had a deep, fatty richness that balanced exquisitely against the dishes peppery overtones. Yeah. I’m into soup. Deal with it. I’d tried the Hong Kong dim sum platter ($15) before and was wowed by the presentation. 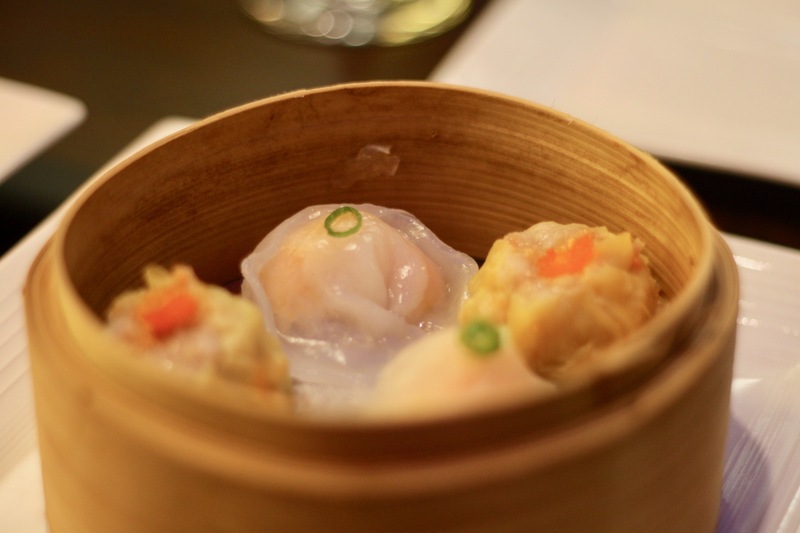 Kwan is a veteran of Fung’s Kitchen, which has a dynamite dim sum brunch, so it’s no surprise he’d want to show off a more focused version of the dumplings and small bites the people crave. 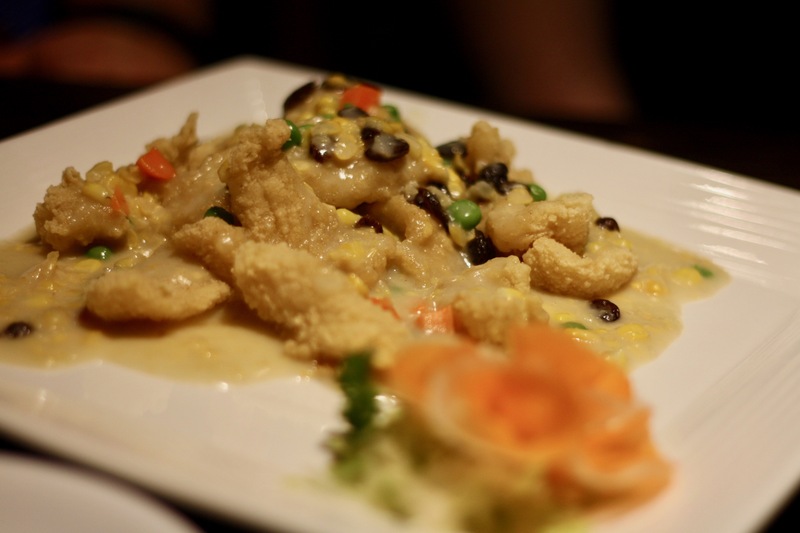 While it sounds crazy, I really enjoyed the salt and pepper halibut ribbons ($12). Strips of halibut are dredged in flour and lightly fried to create this mildly sweet appetizer with a surprisingly fresh aftertaste. Fried fish is so often heavy and oily, but this really was just a gorgeous snack before the main courses arrive. Speaking of light-on-its-flippers fish, Julie surprised us all when she ordered the crispy flaked flounder in crème fraiche creamed corn sauce ($18). I can honestly say, based on the name, I didn’t even give this one a second thought when perusing the menu. But what arrived at the table was some kind of amazing. My notes literally start with, "Wowowowow." First of all, the mix of corn, crème fraiche and vegetables gives the dish a hearty, almost pot pie feel. It’s creamy with bits of pop as you bite into a juicy pea. The flounder is a very mild fish, so the majority of the flavor came from the breading which reminded me of a funnel cake. I don’t know if any of this sounds appetizing to you, but I assure you it was appetizing to us. What an unexpected delight at a restaurant that was already blowing us away. The last two dishes we had are upscale versions of classics: black truffle and black garlic chicken fried rice ($22) and roast quail lo mein ($18). I know, I know...chicken fried rice doesn’t sound terribly exotic and, for the most part, it isn’t. 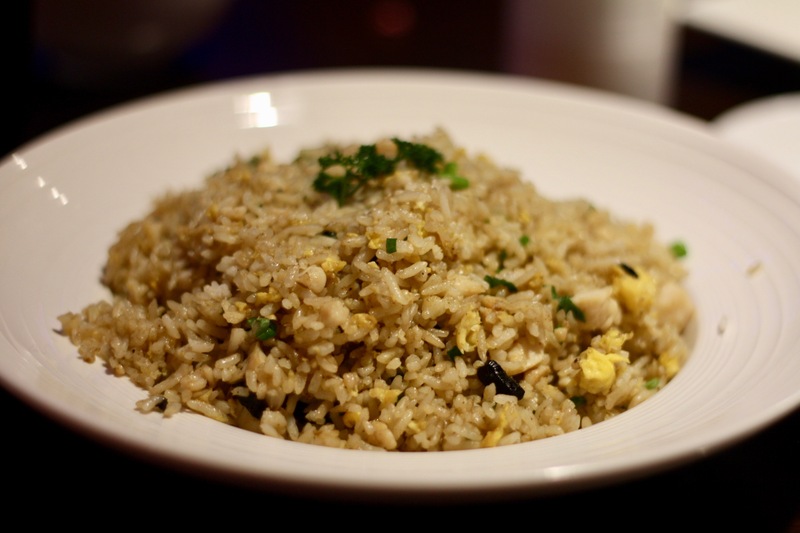 What makes black truffle and black garlic chicken fried rice so good is that, at its base, it’s just really good fried rice. The garlic and truffle could be overwhelming if used improperly, but here a deft hand brings a round, slightly sweet flavor of garlic and rich, earthy mushroom around the edges of each bite, only occasionally taking over with a big burst of flavor. It was a joy. 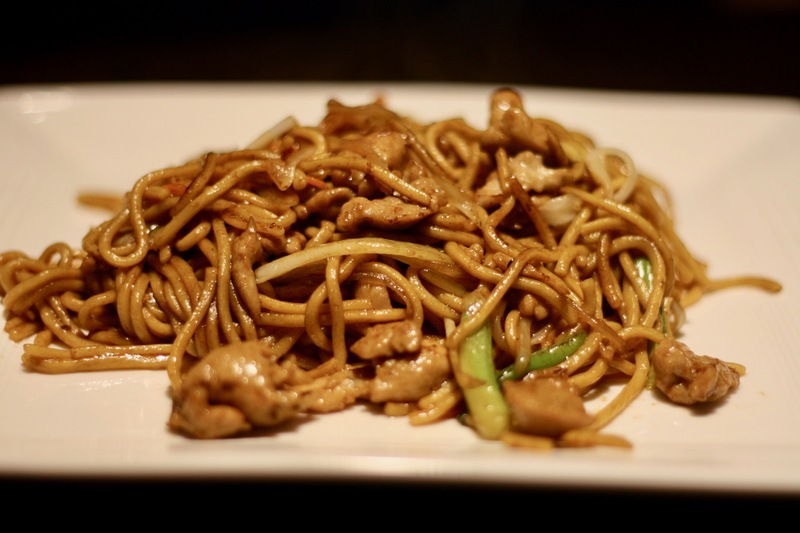 The quail lo mein, again, is notable because it begins with a simple, but expertly done lo mein. The noodles were cooked perfectly, with just enough fat to keep them slick and slurpable but not so much as to leave an oil slick on the plate. The quail was mild and cooked to juicy perfection. Small birds are notoriously easy to overcook, but each bite of meat here was supple and flavorful. I feel like I’ve only scratched the surface of Kwan’s menu, but that just means more reasons to return. From what I’ve had, I can tell you that taking a risk at Kwan’s is no risk at all. The kitchen has a handle on every dish and puts in a lot of care and a good deal of expertise to make each one memorable.